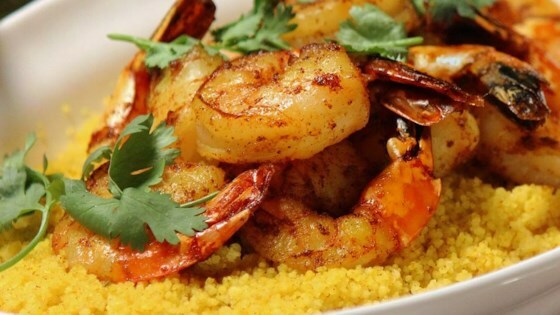 "Take the hassle out of making Spiced Couscous and Shrimp at home with the pure flavor of McCormick® herbs and spices. A blend of turmeric, cinnamon and cumin lends warmth to a traditional homemade Chermoula--a Moroccan herb sauce typically served with seafood. Layer sauce, couscous and shrimp in a bowl for a Moroccan-inspired meal worth gathering around the table for." For the Spice Blend, mix all ingredients in small bowl. Set aside. For the Chermoula, place cilantro, garlic and lemon juice in blender container; cover. Blend until almost smooth. Gradually add oil with machine running. Blend until smooth. Mix in 1 1/4 teaspoons of the Spice Blend. Keep refrigerated until ready to serve. For the Couscous, bring water to boil in small saucepan. Stir in remaining ingredients and another 1 1/4 teaspoons of the Spice Blend. Cover. Remove from heat. Let stand 5 minutes. Fluff with fork. For the Shrimp, toss shrimp with remaining Spice Blend in medium bowl until evenly coated. Heat oil in medium skillet on high heat. Add shrimp; cook 1 minute per side or just until shrimp turn pink. To serve, spoon Chermoula into serving bowl. Top with couscous and shrimp. Garnish with cilantro, if desired.